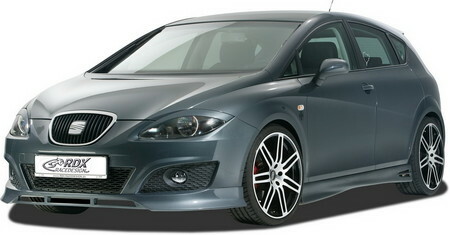 RDX Racedesign is offering a new line of body kits for the new Seat Leon to increase the appeal of this fine and affordable hatchback. They have modified front and rear bumpers in different designs along with front spoiler at front. these spoilers run for 169 Euro. The front-end is also garnished with new registration-free headlight bezel for only € 25. The tuner offers 4 side skirt designs off the shelf, so each driver can modify his Seat Leon individually, based on his imagination. They cost 129 Euro. Every good kit must have rear spoilers and wings! And this one does of course. The rear spoiler with its two large openings and centre brace, and the roof spoiler, they’re available in 2 different designs. The smaller version sells for only € 109 and the larger model is available at a price of only € 149.